My Local Weather has weather stations in various locations around the Yorkshire Dales. These stations collect data and upload it to the website where it's interpreted and displayed in graphical form. The site has grown since starting off with one weather station in 2007 and we've adapted & redesigned it as more stations come online. 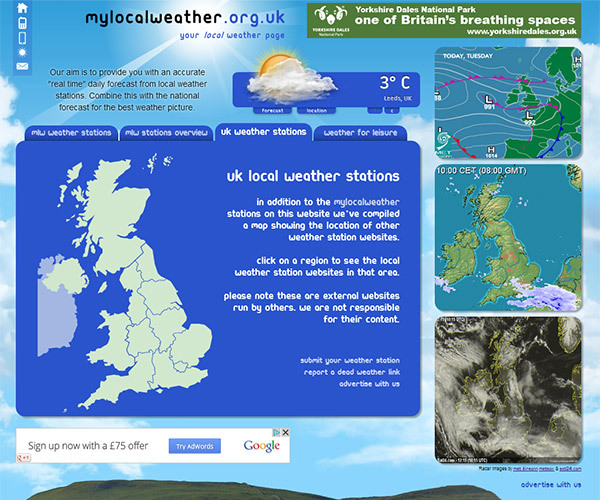 Additional information from other weather websites has been incorporated for a general overview and forecast. An advertising banner system was implemented with an easy to use admin panel allowing the client to manage advertisers, upload new banners and track views & clicks.